One of my (many) health goals this year is to practice yoga more regularly. I love how relaxed it makes me feel, not to mention the fabulous stretches so many poses provide to my body. Yoga exercises focus on working both sides of the body to achieve equal balance, strength and flexibility. My excuse is usually that it’s tough to get to a studio on a regular basis due to work and other commitments. Plus, I already pay for the gym and weekly Zumba classes so sometimes my budget feels a little stretched. But those are really just excuses because there is another place I’m at daily with plenty of space for yoga – home! I’ve participated in enough yoga classes to be familiar with many poses so when I need to stretch or focus on relaxing breaths, I will spend a few moments in various poses. However, to really get a good, relaxing workout in, I feel more comfortable following a video. There are many great videos to purchase for your video player and also to download to your laptop, tablet or mobile device. Some are even free (look on YouTube too). Many of these have specific focus, such as for beginners, arthritis, weight loss and pregnancy. I like videos with varying lengths so I don’t feel anxious if 30 minutes isn’t in my time bank that particular day. Currently, I really like the Core Fusion video that offers five 10-minute segments. This option allows me to fit in a yoga practice with whatever time I have available. And I often find myself feeling so good after a 10-minute segment that I flow into another segment. To get started, define a space that allows you freedom to move and focus. This doesn’t have to be the same space every time. For instance, some days I practice in my living room; if my husband is hanging out there, I’ll move to the bedroom. Just make certain you have room to move easily forward, backward, left and right. Wherever you plant yourself in your house, remove distractions! Turn off the phone, shut down your laptop or tablet (unless you’re using it for the video! ), close the blinds if necessary. Allow yourself the time to focus on you and your body and mind. A yoga mat helps provide stability, traction and cushion during your practice. 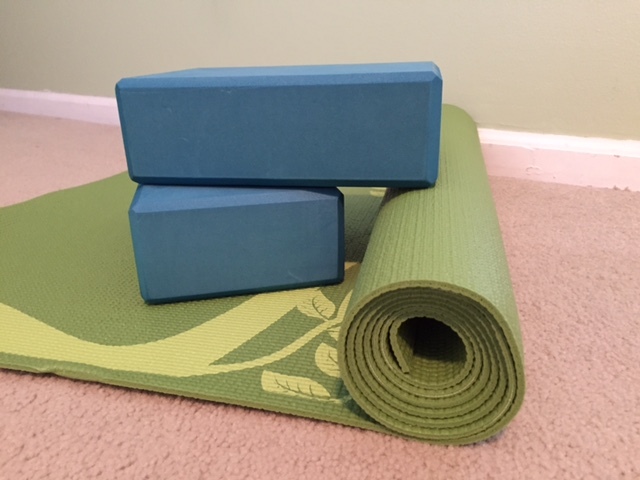 You can find a good yoga mat at many local stores, including Target, REI, and Dunham’s. Most yoga studios also sell mats. Of course you can also use a large bath towel. While most people practice yoga barefoot, you can also purchase socks with rubber grips on the soles to help prevent slipping (just don’t wear shoes). There are also gloves available to help with traction. There are various accessories you can use to help you during poses. I use a yoga block with poses that require more bend than my left knee can do. A strap also can help you get a deeper stretch (you can use a bathrobe tie or belt). Wear comfortable clothes. Nothing too loose so it doesn’t get in the way but you don’t need fancy, expensive yoga pants or shirts. As long as the clothing allows you to move easily, it will work. I sometimes even wear my flannel pajama bottoms with a t-shirt! I’ve been trying to stay focused on my breaths as yoga teaches you do. Just remember not to hold your breath during poses! Try to take one to two breaths between postures to remind you to relax and quiet your mind. Practice at your physical (and mental) level. Hopefully your video shows modifications if needed. The Core Fusion video, for example, has an instructor doing modifications to various poses throughout every segment. Since I have a rod in my femur, I can’t always do the full positions or transition as fluidly. Watching someone demonstrate the modifications makes me more comfortable following along and also helps me stay focused, rather than me pondering how to make the position work for me. My greatest challenge is staying focused on what I’m doing in that moment (yoga), not what I should or need to be doing (laundry, write another blog, make a grocery list, etc.). I admit it’s tough to clear my brain, which is why it helps to take those breaths between poses to remind myself to focus on the present moment. The most important tip I can give you is to just get started! Even if you only devote 10 minutes one day and 20 minutes the next time, yoga is a process and personal accomplishment, not a competition. Be patient and proud of yourself.